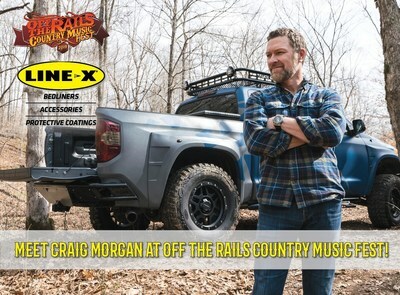 HUNTSVILLE, Ala., April 9, 2019 /PRNewswire/ — LINE-X, a global leader in protective coatings, renowned spray-on bedliners and first-rate truck accessories, is set to create the ultimate tailgating experience at the 2019 Off The Rails country music festival on May 4 – 5 at the Toyota Stadium in Frisco, Texas. LINE-X will provide attendees with the opportunity to win VIP tickets, meet country-music entertainer and U.S. Army veteran Craig Morgan, and its booth will feature an interactive fan experience throughout the weekend where participants can win premium Truck Gear by LINE-X giveaways or a $1,000 truck makeover. LINE-X will showcase two unique trucks in its booth at Off The Rails. The first of which is the company’s “Ultimate-Tailgating Rig” — a Toyota Tundra 4×4 Crewmax featuring its PREMIUM bedliner, exterior coating with LINE-X ULTRA, Truck Gear LXP Hard Folding Tonneau Cover, Truck Gear Drop Steps, prototype Truck Gear roof rack and bumpers. The second vehicle is a Spec Trophy Truck 6100 provided by LINE-X of McKinney/Frisco and Texas Motorworx which specializes in off-road product design, racing and development. The custom Baja-style race truck competes in the Best in the Desert, SCORE and Texas Desert Racing Association series. Performance upgrades include a 495 horsepower GM 6.2-liter LS3 V8 engine, Fusion Offroad chassis, Baja Design LP9 lights, General Grabber X3 tires and King Shocks.